The iPhone has had an enormous impact in a very short time, and the innovations kept on coming: from introducing multi-touch in the first iPhone to the debuts of the App Store, Siri, Touch ID, 64-bit processing and 3D Touch, Apple has taken cutting-edge tech and made it mainstream. So it's a bit disappointing to see leaks suggesting that the iPhone 7 isn't going to be much different from the iPhone 6. But what about a little further in the future, when promising new technologies benefit from Apple's massive R&D budget and make their way into Apple products? We've enlisted the help of Dr Kevin Curran, Ulster University Reader in Computer Science and group leader for the Ambient Intelligence Research Group, IEEE Technical Expert and Royal Academy of Engineering/Leverhulme Trust Senior Research Fellow, to find out what the iPhone of 2020 could really offer. The iPhone will probably still have a touch-based interface, but you'll spend less time using it. You'll unlock your iPhone with your voice, fingerprint or face, and you'll get Siri (and bots from the likes of Facebook and Amazon, whose Alexa is more flexible and seems to do a better job of voice recognition than Siri) to handle most of your everyday actions, whether that's finding information, arranging appointments or ordering takeaway. 2020 might be a bit early, but flexible displays are coming. An origami iPhone is some way off, but a less rigid device has possibilities for new input methods and avoidance of bendgate-style warping. 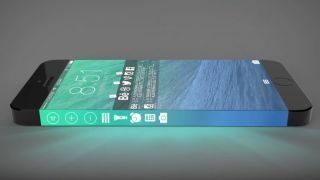 The 2020 iPhone will still be recognisable as a smartphone, though: phones that appear to consist of nothing but a transparent, foldable pane of glass look great in pictures, but the tech to make them won't be ready for a long time. In the shorter term "sapphire screens promise the end to all tears," Dr Curran says, while "other promising materials such as graphene could revolutionise design due to its incredible strength, lightness and slimness. We should also see more ultra thin, ultra-bendable glass such as Corning Willow." One technology many people thought we'd see in iPhones by now is the transflective LCD, which is a display that reflects light so it's legible in direct sunlight. There's a transflective LCD in the Sony Smartwatch 3, but it suffers from the same problem as other transflective displays: in anything other than really bright sunshine it looks awful, with washed out colors and poor contrast. If Apple could find a way to add a reflective layer that didn't look terrible it'd make a huge difference to the iPhone's stamina: transflective displays don't need to be backlit in daylight, which means they use tiny amounts of energy. The most important iPhone screen might not be the one in the iPhone, however. As we've already seen with the Apple Watch and CarPlay, the iPhone can be the brains of other systems: it does the work and they show the results. The iPhone 2020 could and will do more with both the Watch and the car - not to mention the Apple Car - and it could connect to other displays in your home via HomeKit, or screens at work or on your commute. It would be just as gregarious with its inputs, too, connecting to sensors in your car, your home or even your clothes. 8-core processors are already commonplace. Will 16-core be the same by 2020? Four years before the iPhone 6S, the iPhone 4S boasted a 1GHz dual-core, 32-bit Apple A5 processor with 512MB of DDR2 RAM and 8 to 64GB of storage. Today the iPhone 6S has a 1.84GHz, 64-bit Apple A9 chip with 2GB of DDR4 RAM and 16 to 128GB of storage. On that basis and assuming the laws of physics don't throw a spanner into Moore's Law, by 2020 the iPhone should be doing around 4GHz per core with 4GB of RAM and 256GB of storage. How many cores will it have though? In 2013, ARM president Simon Segars predicted smartphones with 16 or 32 cores, noting that while even octa-core processors might seem "crazy" they were imminent and would prove useful: "as you put all this performance in," he said, "somebody will think of something to do with it." Octa-core processors are in phones now, so it isn't inconceivable to have smartphones doubling or trebling the core count by 2020. That means they'll be more powerful than many of today's PCs and Macs. Battery tech advances are quickly negated by more powerful devices and thinner batteries. The iPhone 4S had a 1,430mAh battery and the iPhone 6S Plus has 2,915mAh; with some Android devices already packing 5,000mAh batteries, a 6,000mAh battery in four years isn't far-fetched. However, almost every iPhone has essentially delivered the same amount of battery life irrespective of the size of its power pack: as Apple gets better batteries it makes them smaller and demands more of them, so daily recharges are still the norm. "Battery life advances seem to proceed at a steady rate," Dr Curran says. "On average, we only see improvements in capacity of 6% per annum, so by 2020 we can only really expect a 25% improvement - and it can be hard to isolate battery improvements as we tend to upgrade to higher powered devices with higher pixel densities and faster processors." That's likely to be the case for the 2020 iPhone too, although wireless charging and fast charging - again, common in Android already - will make the routine less painful. But more advanced battery technology is on the horizon, and Apple has been looking at all the possibilities: from hydrogen fuel cells to solar energy capture or lithium-ion "microbatteries" that deliver thousands of times more power and charge almost instantly, there are multiple ways for future iPhones to last longer. "Each week, you can be sure to read about some new battery breakthrough, where in the future we will charge our devices in seconds, but these are to be taken with a pinch of salt," Dr Curran says. "There are promising breakthroughs with regard to lithium-sulfur, supercapacitors, hydrogen fuel cells, solid state batteries and others, but history should tell us to be cautious about any new dramatic claims in having solved the problem of packing energy into a battery. Quite simply, the smaller the battery, the higher the cost-per-watt becomes." However, "If I had to bet on two battery technologies that may be adopted by Apple in 2020, then I would name lithium-sulfur and magnesium-ion." Will Apple ever deliver a battery you don't have to worry about? "This is one thing that will not happen!" Dr Curran says. Another possibility is to put transparent solar cells in front of the display. Apple has so many solar-related patents that Patently Apple has an entire section dedicated to the subject, and photovoltaic smartphone screens aren't sci-fi: Kyocera demonstrated a prototype smartphone with Sunpartner Technologies' Crystal solar glass at MWC 2015. The iPhone 7 Plus is expected to have twin cameras like the Huawei P9. Multi-lens, multi-sensor cameras will be the norm in 2020, at least in larger phones: the iPhone 7 Plus is expected to gain an extra lens this year. Apple spent $20 million acquiring LinX Computational Imaging, whose two, three and four-sensor setups claim to rival DSLR quality. But multi-sensor cameras aren't just about image quality. LinX's technology can refocus like a Lytro camera, and can do amazing things such as removing the background of a video - in real time. Not only that, but it can apparently accurately measure three dimensional spaces, delivers incredibly accurate facial recognition and makes a perfect camera for augmented reality apps. If even half of the claims are true, the 2020 iPhone camera will be astonishing. Just don't buy the 16GB model. "I believe dual-lens rear cameras like the Huawei P9 will be the norm," Dr Curran predicts, with "still images, photo and video that includes input from both cameras, bite-size video clips and action shots that include separate shots of movement in the same frame. They are in effect turning the smartphone into a miniature broadcasting centre." Thermal cameras may be a trend too, Dr Curran suggests, especially for specialist tasks such as detecting heat loss or overheating equipment and seeing in total darkness. AR and VR are areas of intense interest - and acquisitions - for Apple. Apple has filed multiple patents for head-mounted displays over the years - its first video headset patent was filed in 2006 - and in 2013 it acquired PrimeSense, whose patent portfolio included designs for augmented reality glasses and a phone with a built-in projector - designs that tie in nicely with Apple's 2008 patent for a "desk-free computer", which used a projector for its display and took input from multiple wireless sources. Factor in the January hire of VR legend Doug Bowman and it's clear that Apple is keenly interested in VR. Apple has a track record of letting other firms make the mistakes with new tech, so we wouldn't expect any VR/AR product until Sony, Steam, Samsung and Oculus have battled it out, but the 2020 iPhone should certainly have enough grunt to deliver a decent VR/AR experience. "Augmented Reality integration will happen," Dr Curran says. "The AR supporting tools are growing and the price of the AR camera rigs are coming down month upon month." Dr Curran also expects projectors to be common in smartphones by 2020. In a perfect world, his 2020 phone would have "a built-in 8K projector that doesn't drain my battery." The iPhone might have 5G in 2020, but the UK might not. 5G is predicted to be fairly widespread by 2020, although Dr Curran predicts 2025 as a more likely date for widespread coverage unless you live in South Korea. But it should be worth waiting for, delivering the killer combination of very high speeds, very high capacity and very low latency. Mark Zuckerberg reckons 360-degree video will be 5G's killer app, and both AR and VR would benefit too. But 5G might prove to be the fallback, in cities at least: Next Generation Hotspot (NGH) and Wi-Fi Passpoint would enable you to roam across super-fast Wi-Fi networks without having to log on to each new network you joined. NGH Wi-Fi already has the backing of more than 30 phone network operators worldwide. While hype around 5G is building, it's worth keeping some perspective. "What we do know is the International Telecommunication Union allows carriers to call anything 4G so long as it offers a 'substantial level of improvement in performance and capabilities' over 3G. So we can speculate that 5G will simply be anything significantly better than 4G," Dr Curran says. However, the combination of Multiple Input Multiple Output (MIMO) base stations and multiple phone antennae should deliver "significantly better" data and coverage. The iPhone already has NFC for Apple Pay, and that's likely to be used for more forms of authentication: in the US, banks are working on cardless ATMs that support Apple Pay, and the same technology could replace any keycard by 2020. The 2020 iPhone will also likely have the indoor equivalent of GPS, partly thanks to Apple's acquisition of indoor mapping firm WiFiSlam: you'll be able to ask Siri how to get to a particular point in a mall, stadium or train station just as you currently ask for directions to addresses. "Expect to see devices like cars, cameras, microwaves, washing machines, thermostats and so on being controlled through the phone," Dr Curran says. "NFC is playing a larger role in close-range data-sharing and mobile payments. Wireless charging may become the dominant method. Communication protocols will increase with standards such as Wi-Fi Direct, Bluetooth and Miracast." And your phone will sport more sensors too. "We will start to soon see EKG, pulse, slipped pressure, temperature, and humidity sniffers included also. This will enable more accurate environmental sensing, not to mention medical uses."